One of the holy grails for consumer advocates is to make the social and eco implications of purchases more transparent. If we know that a toy has lead in it, the sunscreen contains toxins, or the shirt was made in a sweat shop, fewer people would buy these products and consumer demand would shift to healthy/better alternatives. GoodGuide is a product ratings company, with an innovative mobile app, that aims to make it easy for you to make these more informed purchase decisions. The concept is simple: use your mobile phone to scan a product’s barcode, and the app will show you health, environment and social-impact ratings for the product. It only takes a minute or two, and the accuracy with barcodes is unmatched. It’s straight forward to use if you’re in the supermarket aisle. As far as ease of use, it’s by far the easiest way I’ve found to look up healthy and green product information while shopping. Since I started Care2 nearly 12 years ago, we’ve probably seen 20 other “conscious consumer” product review websites, have heard of a dozen more entrepreneurial endeavors that never launched, and have been approached at least as many times to add product reviews to our site. And, we know our members would love such a service. Product reviews are perennially a top request among conscious consumers. Everyone loves the idea. Testing products thoroughly and independently is very difficult and expensive. Product ingredients/components (and their sources) change – often from batch to batch. There are few agreed upon real standards for eco or social ratings. It’s not even possible to measure some of the big issues (such as the product’s lifecycle carbon footprint). It’s usually difficult for consumers to understand nuanced product ratings across multiple variables. Mistakes can really hurt the reputation of the review guide. In an attempt to bypass many of these issues, some review sites have relied on company-level vs. product-level ratings. e.g. It’s a lot easier to say “Company X is bad” than to do the research to figure out that “sunscreen X is really bad, but sunscreen Y is better”. Some consumer advocates would argue that Company-level screens are sufficient to identify and punish companies that are not eco/socially responsible. However, I believe the best answer is more nuanced as no company is perfect – not to mention that consumers want to know “which product is better than the others” even if no parent company is ideal. And, company-level ratings are close to meaningless when you want to know whether a product is good for you (“health” is the top concern for most consumers interested in these types of ratings). There’s huge demand for this type of information, particularly as mainstream consumers become more aware of the health and environmental implications of their purchases. Market demand is a no-brainer – billions of dollars of consumer spending could be influenced with the right kind of solution. However, how to meet the consumer need is a different question. Even if GoodGuide can solve all those challenges with product ratings, they still need to make a product that meets consumer demand. 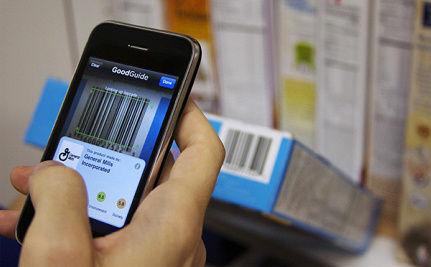 With the introduction of barcode scanning, they’ve made great progress toward getting the information in the hands of the consumer where it matters – in the store. That said, I’ve found the scanner (which works through the phone’s camera) to be rather fickle (works like a charm 30% of the time, and not at all the rest) but that’s likely to be improved in future upgrades to the software (which they’ve licensed from Occiptal). As not all products have bar codes, it’s easy to search by product name instead. Product “reviews” vs “ratings” – while we tend to use those terms interchangeably, there’s a big difference. In our research, we’ve found most consumers really want a review and recommendation, with supporting evidence in the form of metrics/ratings. GoodGuide has focused most of their attention on the latter – metrics-driven ratings – and relies on product reviews from Amazon.com. It’s a short cut to get to a critical mass of ratings that I think could work better if it were made more clear why, for example, “Zout Stain Remover” gets five stars from users, even though it gets the worst health rating (0) from GoodGuide. While the vast majority of products are not yet rated, or only partially rated based on the manufacturer’s reputation, the potential power of robust ratings can be seen in the product pages with more complete profiles. e.g. “Seventh Generation Baby Wipes“. Do they provide the kind of information consumers want? Yes, with the caveat that they lack true “recommendations” as noted above. Will healthy living mavens and activists be happy with what they see? Somewhat. The detail behind the ratings is usually not available, some of the ratings are odd (“Tums for Kids” scores a “10″ for health with these ingredients?? ), and there’s nothing to give me confidence the supply chain has been analyzed (granted, it’s extraordinarily tough to know where and how components were sourced – but these are big ethical concerns for many activists). The company also stumbled with an innacurate warning about the popular Zhu Zhu Pet toy, but that damage to their reputation appears to have been minor, and I chalk that up to a learning experience they’ll be careful to avoid in the future. The two biggest hurdles to this going mainstream are its lack of critical mass of product rankings, and its niche positioning. 1) Critical Mass is the big problem. GoodGuide has set our expectations high. They promise to help us find “Safe, Healthy, and Green Products.” The problem is the vast majority of products I searched for (in my relatively green / healthy home and at WholeFoods) are not yet rated, or contain only unhelpful company-level ratings. This is the classic “crossing the chasm” challenge described by Geoffrey Moore. Techies love (the concept of) the app. Heck, Apple even included it for months in its full page advertisements of cool iphone apps. Deep Greens will also love the concept of the app because it’s the best we’ve seen yet. And while GoodGuide is careful to slap “beta” all over it, the app is sure to disappoint all but the early adopters simply because its so unreliable (i.e. most of the time, you won’t find the product rating you’re looking for). The company says they’ve rated over 70,000 products, yet only a small fraction appear to be full product-level ratings. I’m sure the Company went wide rather than deep on their product reviews for a variety of strategic reasons, but the result is they’ve turned off a lot of early fans. In fact, 47% of customers who have reviewed the latest version on Apple’s App Store give it only 1 or 2 stars out of 5. It’s a shame, because had the company focused on going deep in a single product category – say, household cleaners, or baby foods – and made it clear up front that’s all you’re going to get, I think they’d have much happier customers. Company spokesperon, Jodie Van Horn, says they have a “huge initiative to increase product coverage by rating at least 80% of top-selling products in each new category we add to GoodGuide” – so clearly they understand how important this is to their success. 2) Niche positioning. While GoodGuide’s health ratings position it more broadly than just “green”, the company and app face the classic challenge of a company focused on a psychographic niche. In the future, mainstream consumers will likely rely on Amazon.com, a shopping comparison or coupons app, or some other mainstream shopping app to help them find and purchase the best products at the best price. That makes GoodGuide a “complementary”, but not an “everyday” app. Such apps tend to get forgotten, but it also means it’s much harder to effectively monetize – and given the inherent costs of adding and maintain product ratings, it needs to generate significant income. Since long before the Web, there have been certification organizations and review publications trying to serve this market need. In the last 10 years we’ve seen a number of small social ventures (such as Evo, newcomer Scyrve, and the now shuttered Fivelimes and IdealsWork), some nonprofit ventures (such as Alonovo, the new ProjectLabel, Greenguide – acquired then put in a deep freeze by National Geographic, Consumer Reports’ GreenerChoices.org and GreenAmerica’s ResponsibleShopper), and numerous “green seal” type certification labels… but to my knowledge, only Goodguide has been funded by traditional Venture Capital. While I think entrepreneurs often turn too readily to VC, this is an example where there’s probably no realistic alternative, given the large amounts of capital required to make product-level ratings successful. GoodGuide has secured $9.2 million in funding from high quality VC with deep pockets, so there’s more money available if they can meet the expectations of their investors (and I suspect it’s going to take a lot more money before GoodGuide reaches profitability). It’s great to see that GoodGuide is, like Care2, a B-Corporation (as in “for Benefit”) which demonstrates its true commitment to making the world a better place. And, I commend the Venture investors for seeing the value in this corporate structure. The company has begun licensing their ratings for use by mainstream retailers (e.g. TheFind.com and Alice.com) – which is great for consumers, but it’s a tough path for GoodGuide to generate big revenues unless they can demonstrate their ratings will significantly increase the licensee’s sales. In fact, the company describes this as “a very small stream of affiliate revenues” coming from these relationships. While revenues may not yet be their top priority, even VC’s with deep pockets are going to start to demand strong revenue growth over the next year or two. With roughly 15 employees, they’re spending at least $1.5 million a year, and with all of the testing probably more like $2.5 million. The last funding round for $5.5 million was in June 2009, so that probably means they have around $4 million in the bank, and will need to generate siginificant revenues or go out for more money sometime in 2012. It’s not entirely clear to me how they’ll reach $100 million in revenues (a number that would get the VC and potential acquirers excited), but given the amount of consumer interest, and the service’s proximity to purchasing decisions, I don’t doubt there’s a way to reach that level. I have the upmost respect for the GoodGuide team – they’ve taken on a Herculean task, have made significant inroads, and should be commended for their efforts. I think the jury is still out as to whether they can reach a critical mass of product reviews, and the visitor traffic and revenues to support the costs, but I’d give them the best chance of any healthy and green product review company I’ve seen yet. Let’s hope they make it happen, as their service has fantastic potential for good. Click here to download and try out the GoodGuide app yourself! Thanks for the article. It does sound like a very good idea with a marketing future and one has to give them kudos for the innovation. Yet it is still necessary and maybe the best idea in a long run to simply enforce a LABELING SYSTEM for all products. Things must be identifiyable by potential buyers without a smartphone on them as well. But I realize that this requires enormous costs to do the testing and rating. In Germany we have foundations taking care of this, such as "Stiftung Warentest" which has been established for many decades and is widely used by consumers. This is very cool. Hopefully in the future it will be more widely available on all types of smart phones & be much more reliable. Voted. Very interesting to know about. Thank you Good Guide team. very interesting thankyou for post. this is a great idea, I love it! the only thing is you have to have a phone with this app. I don't have a phone with internet, just a funky little phone. But this is a greast idea, it really helps the consumer learn to eat and shop smarter! This is definitely something to think about !! !